This report describes investigations into predation by piscivorous colonial waterbirds on juvenile salmonids (Oncorhynchus spp.) from throughout the Columbia River basin during 2008. East Sand Island in the Columbia River estuary again supported the largest known breeding colony of Caspian terns (Hydroprogne caspia) in the world (approximately 10,700 breeding pairs) and the largest breeding colony of double-crested cormorants (Phalacrocorax auritus) in western North America (approximately 10,950 breeding pairs). The Caspian tern colony increased from 2007, but not significantly so, while the double-crested cormorant colony experienced a significant decline (20%) from 2007. 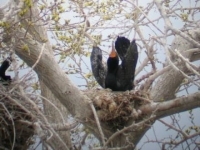 Average cormorant nesting success in 2008, however, was down only slightly from 2007, suggesting that food supply during the 2008 nesting season was not the principal cause of the decline in cormorant colony size. Total consumption of juvenile salmonids by East Sand Island Caspian terns in 2008 was approximately 6.7 million smolts (95% c.i. = 5.8 – 7.5 million). 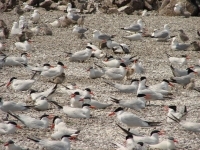 Caspian terns nesting on East Sand Island continued to rely primarily on marine forage fishes as a food supply. Based on smolt PIT tag recoveries on the East Sand Island Caspian tern colony, predation rates were highest on steelhead in 2008; minimum predation rates on steelhead smolts detected passing Bonneville Dam averaged 8.3% for wild smolts and 10.7% for hatchery-raised smolts. In 2007, total smolt consumption by East Sand Island double-crested cormorants was about 9.2 million juvenile salmonids (95% c.i. = 4.4 – 14.0 million), similar to or greater than that of East Sand Island Caspian terns during that year (5.5 million juvenile salmonids; 95% c.i. = 4.8 – 6.2 million). The numbers of smolt PIT tags recovered on the cormorant colony in 2008 were roughly proportional to the relative availability of PIT-tagged salmonids released in the Basin, suggesting that cormorant predation on salmonid smolts in the estuary was less selective than tern predation. Cormorant predation rates in excess of 30%, however, were observed for some groups of hatchery-reared fall Chinook salmon released downstream of Bonneville Dam. Implementation of the federal plan “Caspian Tern Management to Reduce Predation of Juvenile Salmonids in the Columbia River Estuary” was initiated in 2008 with construction by the Corps of Engineers of two alternative colony sites for Caspian terns in interior Oregon: a 1-acre island on Crump Lake in the Warner Valley and a 1-acre island on Fern Ridge Reservoir near Eugene. We deployed Caspian tern social attraction (decoys and sound systems) on these two islands and monitored for Caspian tern nesting. Caspian terns quickly colonized the Crump Lake tern island; about 430 pairs nested there, including 5 terns that had been banded at the East Sand Island colony in the Columbia River estuary, over 500 km to the northwest. No Caspian terns nested at the Fern Ridge tern island in 2008, but up to 9 Caspian terns were recorded roosting on the island after the nesting season. There were two breeding colonies of Caspian terns on the mid-Columbia River in 2008: (1) about 388 pairs nested at the historical colony on Crescent Island in the McNary Pool and (2) about 100 pairs nested at a relatively new colony site on Rock Island in the John Day Pool. Nesting success at the Crescent Island tern colony was only 0.28 young fledged per breeding pair, the lowest nesting success recorded at that colony since monitoring began in 2000, while only three fledglings were raised at the Rock Island tern colony. The diet of Crescent Island Caspian terns consisted of 68% salmonid smolts; total smolt consumption was estimated at 330,000. Since 2004, total smolt consumption by Crescent Island terns has declined by 34%, due mostly to a decline in colony size, while steelhead consumption has increased 10% during this same period. In 2008, approximately 64,000 steelhead smolts were consumed by Caspian terns nesting at Crescent Island. Based on smolt PIT tag recoveries on the Crescent Island Caspian tern colony, the average predation rate on in-river migrants from the Snake River (all species and run types combined based on interrogations at Lower Monumental Dam) was at least 1.4%. Predation rates on PIT-tagged steelhead smolts were greater than those for other salmonid species; 6.0% of wild steelhead smolts from the Snake River were consumed by Crescent Island terns. The double-crested cormorant colony on Foundation Island in the mid-Columbia River consisted of at least 360 pairs nesting in trees in 2008. The proportion of juvenile salmonids in stomach samples collected from cormorants nesting on Foundation Island during the peak of the smolt out-migration was about 45% of prey biomass. 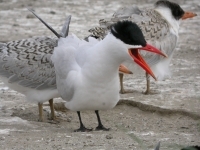 The average predation rate on in-river migrants from the Snake River (all species and run types combined based on interrogations at Lower Monumental Dam) by Foundation Island cormorants was at least 1.3%, similar to that for Crescent Island Caspian terns. Steelhead smolts from the Snake River were particular vulnerability to predation by Foundation Island cormorants. Some double-crested cormorants over-winter on the Columbia Plateau along the Snake River. Boat surveys conducted from October 2008 to February 2009 indicated that an average of 281 cormorants were present on the lower Snake River over-winter, with the highest concentration of cormorants observed between Little Goose and Lower Granite dams during the months of October and November. Stomach contents indicated that juvenile salmonids comprised about 12.5% by mass of the diet of these double-crested cormorants. Genetic analyses of salmonid tissues removed from cormorant stomachs are in progress. Other piscivorous colonial waterbirds that nest along the mid-Columbia River (i.e., California gulls, ring-billed gulls, American white pelicans) are having much less impact on the survival of juvenile salmonids from the Columbia and Snake rivers, compared to Caspian terns and double-crested cormorants. One gull colony that may be having an appreciable impact on salmonid smolt survival, however, is the large California and ring-billed gull colony (~ 4,500 nesting pairs) on Miller Rocks in The Dalles Pool, where an estimated 4,211 smolt PIT tags were deposited during the 2008 nesting season or 0.9 smolt PIT tags consumed per nesting adult. This colony’s large size and proximity to John Day and The Dalles dams is of concern to some fisheries managers, especially given that the number of PIT tags recovered on Miller Rocks has increased in recent years. 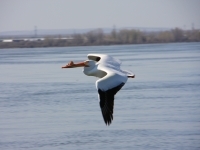 At the American white pelican colony on Badger Island in the mid-Columbia River, an estimated 2,101 smolt PIT tags were deposited in 2008; this represents about 1.6 PIT-tagged smolts consumed per nesting adult at this growing colony. Although the number of smolt PIT tags recovered on Badger Island has increased in recent years (coincident with an increase in colony size), total numbers of recovered smolt PIT tags are still relatively low compared to the nearby Crescent Island Caspian tern colony and Foundation Island double-crested cormorant colony; per capita PIT tag consumption was 13.6 and 14.7 PIT tags per nesting adult on the tern and cormorant colonies, respectively. In 2008 we investigated how smolt morphology, condition, and origin are related to differences in smolt vulnerability to avian predation. We condition scored and PIT-tagged 9,180 steelhead smolts on the lower Snake River and 7,271 steelhead smolts on the mid-Columbia River during the 2008 out-migration. Preliminary results indicate that 23% of the PIT-tagged steelhead that were released into the lower Snake River and 18% of the PIT-tagged steelhead that were released into the mid-Columbia River and survived to the Columbia River estuary were consumed by colonial waterbirds nesting in the estuary; the comparable percentages for lower Snake River steelhead smolts found on waterbird colonies in the McNary Pool and the John Day/The Dalles pools were 8.5% and 2.3%, respectively, and for mid-Columbia River steelhead smolts were 3.5% and 1.9%, respectively. Predation by Caspian terns nesting at an off-river colony in Potholes Reservoir, WA was an estimated 7.6% of steelhead smolts released into the mid-Columbia River. Smolt condition-scoring results demonstrated that smolts with severe external damage were, on average, 1.6 times more likely to be consumed by avian predators in McNary Pool compared to undamaged smolts. A Columbia Basin-wide assessment of avian predation on juvenile salmonids indicates that the most significant impacts to smolt survival occur in the Columbia River estuary, with the combined consumption of juvenile salmonids by Caspian terns and double-crested cormorants nesting on East Sand Island estimated at between 7 and 16 million smolts annually. This represents approximately 10% of all the salmonid smolts that survive to the estuary in an average year. Estimated smolt losses to piscivorous colonial waterbirds that nest in the Columbia River estuary are more than an order of magnitude greater than those observed on the mid-Columbia River. Additionally, when compared to the impact of avian predation on the Columbia Plateau, avian predation in the Columbia River estuary affects juvenile salmonids belonging to every ESA-listed stock of salmonid from throughout the Basin that have survived freshwater migration to the ocean and presumably have a higher probability of returning as adults. For these reasons, management of the colonies of Caspian terns and double-crested cormorants on East Sand Island has the greatest potential to benefit ESA-listed salmonid populations from throughout the Columbia River basin, when compared to potential benefits of management of other populations of piscivorous waterbirds. The Caspian tern colonies on Crescent and Goose (Potholes Reservoir) islands and the double-crested cormorant colony on Foundation Island may be exceptions to this rule; management of these relatively small colonies on or near the mid-Columbia River may benefit certain salmonid populations, in particular steelhead. In order to reduce predation on juvenile salmonids by double-crested cormorants in the Columbia River estuary, it will be necessary to reduce the size of the cormorant colony on East Sand Island. Resource management agencies have not yet decided whether management of this large cormorant colony is warranted. Because the cormorant colony on East Sand Island constitutes nearly 50% of the entire Pacific Coast breeding population of double-crested cormorants, non-lethal management approaches, such as relocating a portion of the colony to alternative colony sites along the coast of Oregon and Washington, seem more appropriate than lethal control. As was the case with Caspian tern management in the Columbia River estuary, any management of double-crested cormorants to reduce smolt losses in the estuary will likely require an analysis under the National Environmental Policy Act (NEPA), including assessments of the (1) population status of Pacific Coast double-crested cormorants, (2) availability of suitable alternative nesting habitat outside the Columbia River basin, and (3) potential enhancement of salmonid recovery rates in the Columbia River basin should management of cormorants be implemented in the estuary. In 2008, work was initiated on an updated status assessment for the Pacific Coast population of double-crested cormorants.